My blog post yesterday detailing results of the under-extrusion experiment seems to be getting some attention - it had the highest number of views in the first 24 hours of any post I've made to date. In this follow-up post I'm going to show - at a very high level - how the voids are distributed and how large they are. In the under-extrusion experiment and my standard print conditions, I use an extrusion width equal to the diameter of the orifice so the analysis here assumes that. If your extrusion width is larger or smaller than the nozzle orifice diameter, things get more complicated, fast. I've been doing these experiments and studies for several years. I've also dissected a lot of parts and have attempted to cut the parts in cross section so I can scrutinize the deposited filament under magnification. I've never been able to get clear photos but I am working on it. You'll have to take my observations at face value - or conduct your own experiments to confirm my assertions. Based on part observations, I modeled the deposited filament cross-section as a round cornered rectangle. In reality, they are a more complicated geometry and the first layer geometry is different than upper layers due to the constraint imposed by they bed (it is perfectly flat, unlike printing on an existing extruded layer). As a simplification, I performed my analysis and calculation on cross-section area and not on extrusion volume. In practice, filament deposition happens when the nozzle moves in the X-Y plane and that introduces shear forces that further affect the cross-sectional geometry. But, I assert, there is a lot to be learned from this simple two-dimensional analysis. Next, I assumed that in all three cases the extrudate width and height will be the same - in this case 0.4mm (W) and 0.2mm (H). So, the task was to calculate the corner radius that results in the target cross-sectional area. I'll leave the math as an excercise for you, dear reader, but if you are interested please post in the comments and I'll fill in the details. Here are the calculated corner radii in mms. Take a close look at these cross-sections. Even at the extreme 20% under-extruded case, the void is surprisingly small and, more interestingly, are precisely distributed at the intersection of extrudate corners in the part. Note that in reality, even the corners of the 100% case are rounded over so one has to ask where that extra filament went. Does it result in a slight width increase of the extrudate or does the slicer attempt to compensate by slightly under-extruding? I've done the back-calculations for g-code created by KISSlicer, Cura, Slic3r and Simplify3D to see how they actually handle it. This will be the subject of a future post. Keep in mind that this deposition is happening at a very small scale, fairly quickly, and requires movement of the nozzle in the X-Y plane. As the molten filament is deposited, it can flow (i.e. distort) until it solidifies due to cooling. This can result in various distortions from the hypothetical simple case shown above. But guess what, looking at parts under reasonable magnification, it really does appear remarkably consistent with this simple case (for PLA extruded under reasonable conditions). 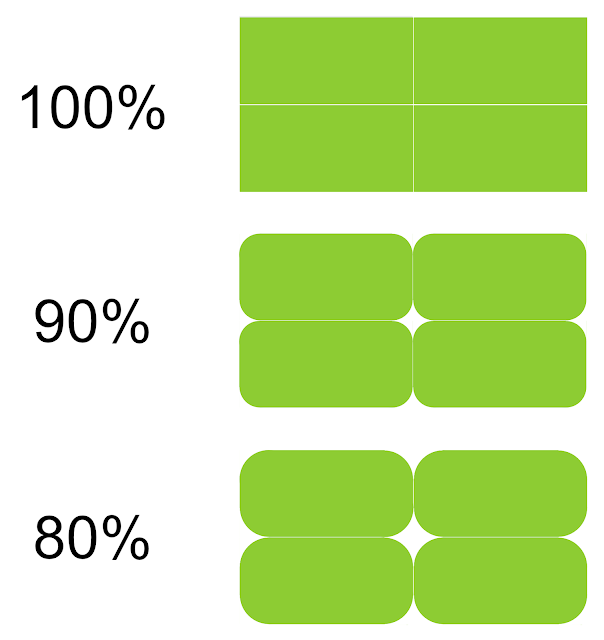 I'll leave you with one last drawing showing the 100% and 80% cases side-by-side at relative scale. If you look at your nozzle closely, you'll observe that the orifice is centered in a flat field. This field drags over the deposited filament and contributes to pressing it down into the bed or layer below. I don't have experimental evidence for the shape of the 80% under-extruded case shown on the right side of the drawing. I derived it - a simple trapezoid - by observing squeezing toothpaste against a counter top to simulate extrusion. 7 comments to ''Musings on Under-extrusion - More to think about"
Thanks, I am familiar with Ryan's excellent work. And impressed with the cross section photography. So looking at the 02x04 example on the far left, the void appears to be more triangular (slightly curved) on the bottom of the extrusion with very little void on the top for 5-10% under-extrusion. I'll re-run my calculations using this cross-section just for grins. My goal here is to create awareness that FFF 3D printing is remarkably robust to under-extrusion and that stressing over 1% is probably not necessary - the "chasing zeros" comment I made. Ryan's experiment corroborates that and in fact, shows that the part's top surfaces may be much smoother (more completely filled) than my simplistic model shows. Thanks for the comment and link! That's a cool idea. I have something similar I could try. Thanks! Its been awhile since I saved a video but I think these were with a 2 mp camera. A 5 mp camera (super eyes) is much sharper. I normally print very small parts with a .1 or .15 nozzle so the camera is a big help to ensure the process looks good early in the print. Soon I plan to increase magnification with better lighting in an attempt to improve video/image quality.